While locating and documenting CNC’s students of the first decade (the First Decaders), I have asked each about military service. I now have a list of 117 who served in the 1960s or later--105 documented and 12 not yet located. To honor them for their service, this article names all 117 of our veterans and lists (where known) their military branches, overseas deployments, and ranks they held when they left service. Included also are photos of some of them during their military service and interesting facts and some of their memories. Part 1 of this article is a tribute to the 52 U.S. Army veterans, 23 of whom served in Vietnam and 2 in Germany. Two were killed in action (KIA)-- Army Lieutenant Richard Duncan (Ric) Bahr and Marine Major John Patrick (Pat) Giguere, a Cobra pilot who escaped death in Vietnam only to be shot down in1983 in the Grenada Invasion. Ric Bahr (Warwick H. S. photo top R) is the subject of two essays by Wade Williams, located in our Website ARCHIVES under the sub tab YOUR MEMORIES. A 2-part tribute to Pat Giguere (USMC photo bottom R) is also in our website ARCHIVES under the sub tab FIRST DECADE HISTORY. Identical twins Carlton and Claude Stanley both served in Vietnam. The photo left shows Carlton (L), who commanded an intelligence unit and Claude (R), who piloted Huey helicopters (photo right), used to transport troops to and from combat and armed for defense in case attacked. Carlton retired from the army as Colonel; Claude as Lt. Colonel. Photos sent by Claude. To keep it from being a long and possibly monotonous reading experience, this alphabetized list is broken by photographs and texts. Jim Eyre (above left & middle), who sent these photos, was a First Lieutenant with the Mobile Riverine Force (right above) in the Mekong Delta. 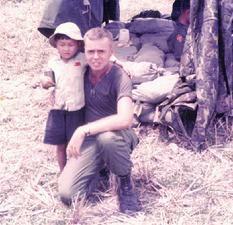 Of his time there he wrote: One experience in Vietnam especially remains vivid in my memory. We were on patrol, traveling a dirt road. Down the road, we spotted a small child with some bags piled on the road. Knowing that the Viet Cong often used small children as booby traps, we sent a team of men around our right flank. They came on a group of VC lying in ambush and soon scattered them. We found the child was indeed sitting on a booby trap. After carefully defusing the bomb and him, I interestingly interrogated him with the help of our interpreter. After some amusing conversation, we returned him to his village. This event is something I have never forgotten because it was a memorable example of how cheaply life was valued in Vietnam. BERT GIMM Germany 1st LT.
Kenneth G. (Ken) Smith served in the Army from July 1965 - July 1968. Trained as a stenographer, he was first at Fort Lee and then in Vietnam, where he served first with the First Cavalry Division, An Khe; Headquarters, U.S. Army Vietnam, Long Binh. He was in Long Binh during the 1968 Tet offensive. Next he was with Provisional Corps Vietnam, Phu Bai, where he first served as secretary to General Creighton Abrams and later prepared briefing files for General William Rosson. 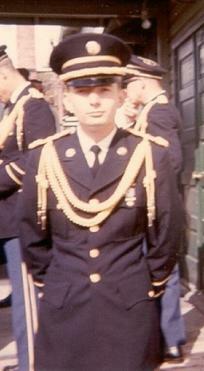 Ken sent his 1965 photo in dress uniform at Fort Jackson, S.C.
Ed Knight (deceased) joined the Army and attended Officer Candidate School, Infantry, while completing his law degree at William and Mary in 1968. He was transferred to Judge Advocate General (JAG) in 1969 and served in Vietnam May 1970 - May 1971. 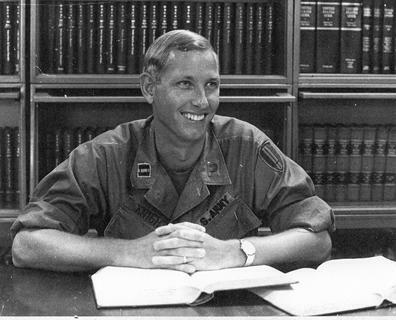 The photo of him at his desk in Vietnam was sent by his widow, Carolyn Knight. Ed also served June 1971 - Jan. 1973 at Fort Monroe and afterwards served in the Army Reserve, retiring as Colonel in Feb. 1996. He received the Army Commendation Medal and other awards. He had a 20-year law career and 12 years as District Court Judge, plus 8 years on Hampton's City Council. Ronald Lowder, Sr. (left above) and Paul Darden (right) were both musicians before their Army service, so quite naturally they both served as musicians while in the Army. Ron was stationed at Fort Eustis 1966 - 1969 as a clarinetist, performing in both the Stage Band, which played popular music, and the Concert Band. Paul was stationed at Fort Monroe 1968 - 1971 as a percussionist, playing in the U.S. Continental Army Command Band. As civilians Ron and Paul played together in bands such as "The Sheepherders" and "Just Us." Paul later became a publisher (publications include Coastal Virginia magazine). Ron had a long career with the federal government, followed upon retirement with renewal of his music career. He and son Ron, Jr. co-own Lowder Sound & Academy of Rock Music, with locations in Newport News and Virginia Beach. Ron writes, records and performs music both alone and with several bands. He is an outstanding pianist and saxophonist--and also our website's webmaster. Photos courtesy of Ron and Paul. Thomas W. (Tom) Redman (above L) served 35 years (1965 - Jan. 2005) active duty in Army Intelligence, mainly at TRADOC, Fort Monroe. He retired as Chief Warrant Office (CW4), then worked full time two years in Civil Service, followed by several more years part time. The photo he sent is of Tom at McDill Air Force Base in Tampa in 2003, at the CENTCOM Joint Intelligence Center. 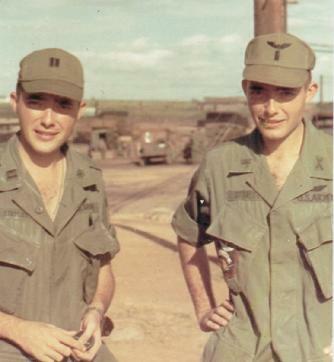 David Scoggins (right) served in the Army from Sept. 1968 to Feb. 1972. His rank in the photo he sent was Corporal E4; he left the service as Specialist 5. The photo was taken by his wife, Julia, on Jan. 1972 in their off base apartment in the town of Herzogenaurach in Bavaria, Germany. David was stationed at Herzo Base, an Army Security agency field station. 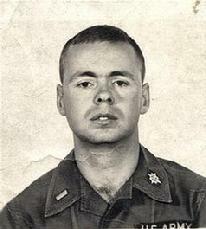 CLAUDE STANLEY Vietnam LT. COL. 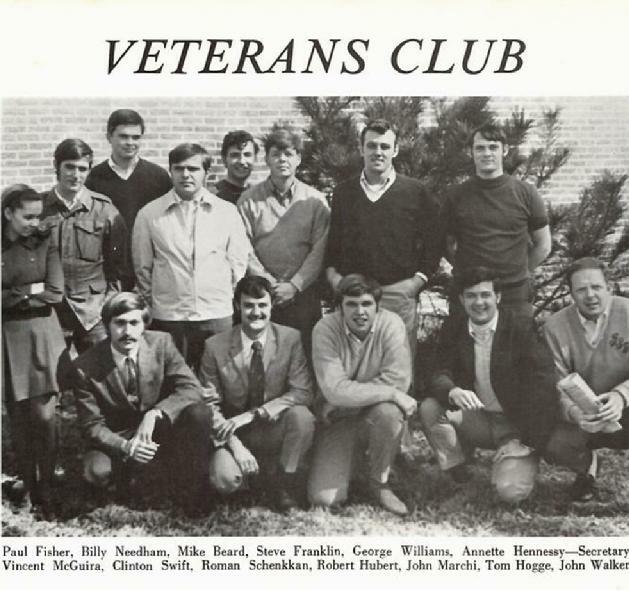 The above photo of the FIRST VETERANS CLUB at CNC was printed in the 1968 Trident, p. 80, with no last names of the men. 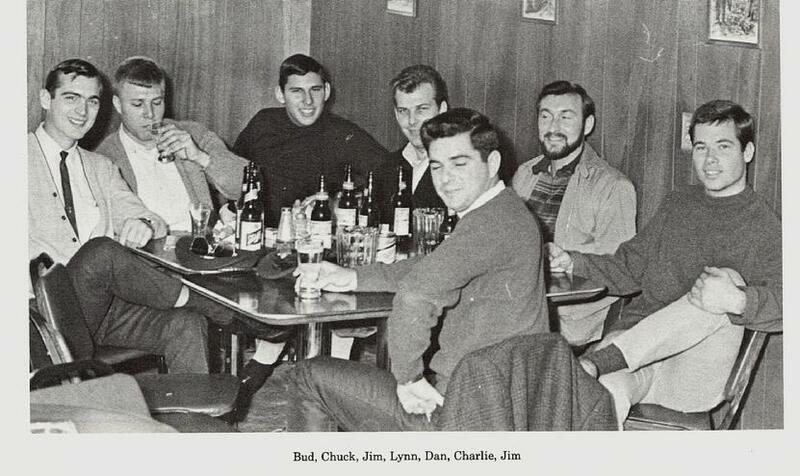 Jim Fronkier, who was the club's president, has identified all of the men as (clockwise from left) Tabe "Bud" Woolard (Secretary), Charles “Chuck” Bell, Jim Fronkier (President), Lynn Lindberg, Dan Clark, Charlie Sills, and foreground, Jim Walsh (Vice President). Please contact me (email below; phone: 757-238-9629) if you can help locate any of these veterans. Thank you. Part 1 of this article honored CNC's 52 First Decaders who served in our nation's Army and also the two killed in action: Ric Bahr (Army) and Pat Giguere (Marines). Part 2 honors the 23 First Decaders who served in the Navy and 10 who served in the Marines, plus our first and second CNC presidents who served in combat--H. Westcott (Scotty) Cunningham (Navy) and President James C. (Jim) Windsor (Marines). Scotty Cunningham (family photo), a Navy lieutenant in WW2., served two years in the Pacific commanding a PT (Patrol and Torpedo) boat, when John F. Kennedy, whom he knew, was doing the same in his PT 109. It was very hazardous duty; many men and boats were lost. Cunningham served again during the Korean War, but having contracted malaria in the southwest Pacific, he couldn't fight in Korea; instead he served as a military briefer at the Pentagon. From 1953 through 1970, he was also an active member of the Naval Reserve, retiring at the rank of Captain. Our website's tab ARCHIVES, sub tab FIRST DECADE HISTORY, has more information about Scotty's military experience. 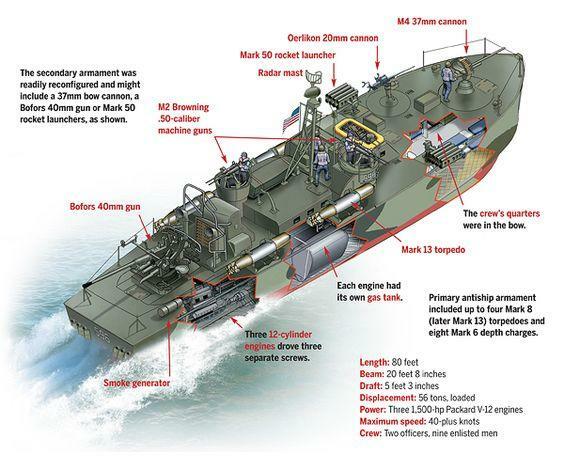 Internet drawing of ELCO style PT boat. Photo left above is from the 1966 Trident; photo right is courtesy of Dr. Sean Heuvel. Jim Windsor joined the Marines after high school and served in Korea on an anti-tank platoon which also set and disarmed mines --dangerous work with frequent casualties. For him, the most difficult experience was losing friends: " When you are in combat," he wrote, " and getting shot at, your world shrinks down to the small portion of the earth you occupy, and to the few comrades on whom you depend. There is a strong bonding and you look after each other. You fear letting your buddies down more than you fear the enemy or death. We suffered a lot of casualties (dead and wounded) and were fully aware that we were living in harm's way. I was wounded, but not seriously and ... have felt since then that every day is a gift. Many of my comrades did not have the chance to grow up, and I have felt blessed all of my life.” Jim was awarded a purple heart and a medal for valor. 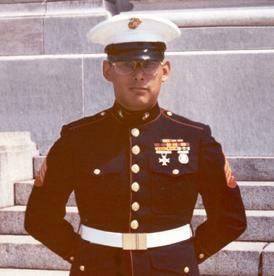 Our website's tab ARCHIVES, sub tab YOUR MEMORIES, has more of Jim's USMC memories. At least four served in Vietnam. Anthony Lee (Tony) Williamson (above left) enlisted in the Navy in November 1966 and was discharged honorably in July 1970 as an Aviation Machinist Mate 2nd Class (PO2: Petty Officer). He then attended CNC 1970 -73, completing his BS in business administration in 1973. The photo above was taken January, 1967 at the USN Recruit Training Command (RTC), Great Lakes, IL--familiar to Navy veterans. 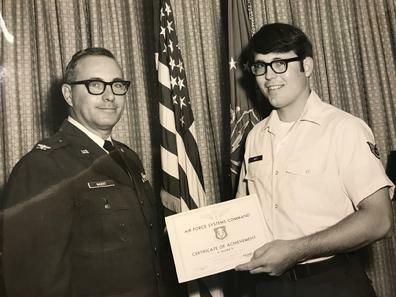 After 3 semesters at CNC, Robert A. Slusser (above right), served in the Navy ten years (1965-75) and, like Tony, was also in the field of aviation maintenance, leaving as an Aviation Maintenance Administration man First Class (AZ1). He served in Japan and the Philippines. His photo above was taken in a aircraft hanger at the US Naval Air Station at Sangley Point, Philippines in 1969. After earning his AA degree at CNC in 1968 and BS in psychology at ODU in 1969, John William Moore (left above) served three years on active duty in the Navy (1969-72), then four years in the Naval Reserve while also earning his MA in psychology. He left the Navy as Musician 2nd Class (MU2). 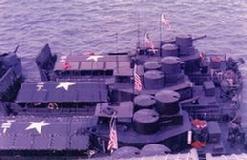 John's picture was taken aboard the USS Columbus in January of 1971. After earning a Ph.D. in psychology, he became a professor and then senior systems computer analyst at Belmont University. 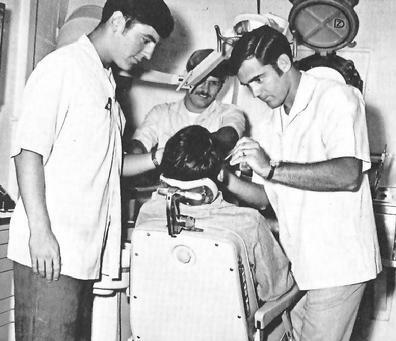 After completing his AA at CNC in 1965 Raymond Alan (Ray) Pepe (right above as Ensign) joined the Naval Reserve, enabling him to serve his country while also earning his baccalaureate degree at William and Mary. 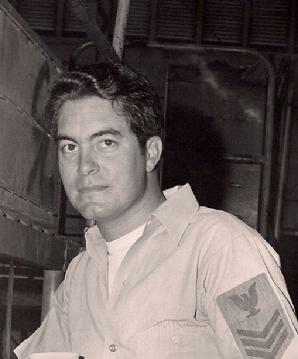 He was on active duty for two years (1967-69) on the USS Dewey (DLG-14) , serving six months of that time in Vietnam on search and rescue missions (Jan.- June 1968). He left the reserve in 1994 at the rank of Commander (CDR). 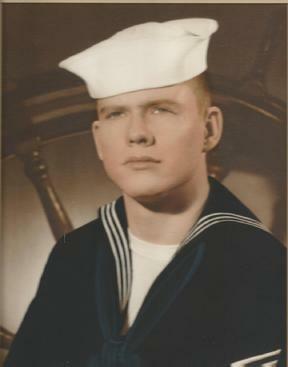 David A. Spriggs (photos above) enlisted in the Naval Reserve in May 1964, then enrolled at CNC as a freshman that fall. After receiving his letter of acceptance from the U.S. 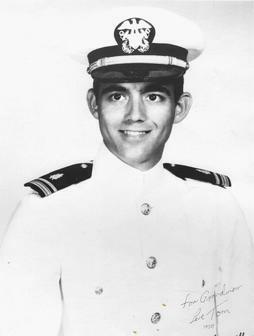 Naval Academy and completing his first semester at CNC, he entered the Naval Academy on June 30, 1965 and graduated June 4, 1969, commissioned as Ensign. He served on active duty until June 30, 1980, then accepted a commission as lieutenant in the Naval Reserve. He retired as Captain, USNR on June 30, 1998, having served a total of 34 years and 2 months. 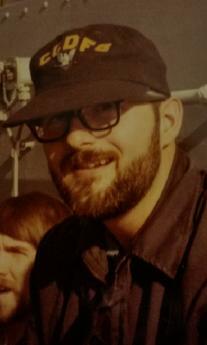 The left photo shows David as LTJG aboard the USS Leary (DD-879) at Valetta, Malta, in July 1970. 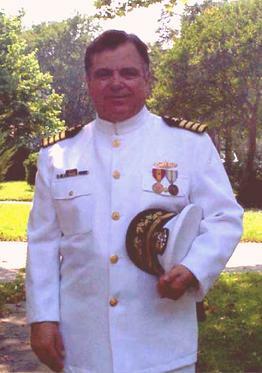 The right photo shows him in his Navy Captain uniform in Norfolk in July, 2004. 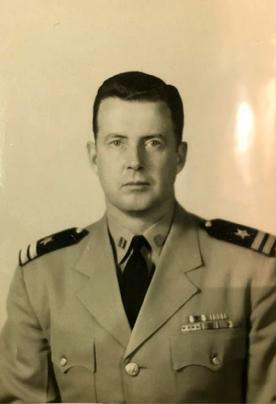 Thomas E. (Tom) Witty, Jr. (photos above), earned his AA at CNC in 1965, his BS at William & Mary in 1967, and his DDS at MCV in 1971--after which he joined the Navy. He served two years active duty (1971- 1973) as a dental officer on the USS Vulcan (AR-5). The left photo shows Tom as a LTJG. The right, a promotional picture for the USS Vulcan, shows him examining a patient's teeth. He also served in the Naval Reserve for fifteen years, being discharged as a LCDR-R.
At least 5 served in Vietnam. Above are the Boot Camp photos of Wayne A. Evans (left ) and Jack N. Spearman (right), both made at Parris Island, NC-- where they, like Jim Windsor and many more, learned to be Marines. 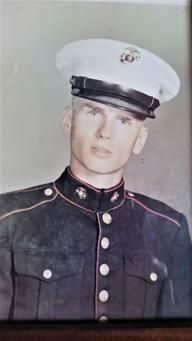 Wayne served in the USMC and USMCR from 1958-66, while also beginning studies at CNC in 1962-63 and continuing them later--mainly through night classes between job transfers in and out of state. He left service as sergeant E5 and earned his BS in business at CNC in 1993. Jack attended CNC first in 1962-64. He was the photographer for CNC's first yearbook, the 1964 Trident. 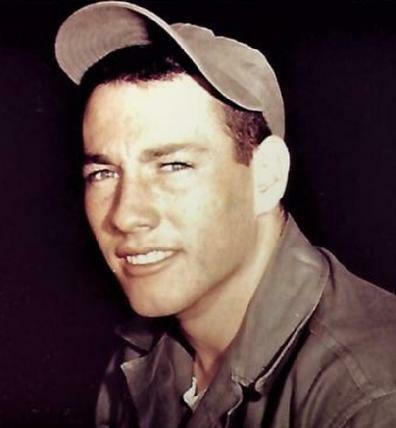 He then served in the USMC from 1964-67, including deployment in Vietnam, and was honorably discharged as corporal. He then attended CNC again while working in the chemical research lab for Dow Badische in Williamsburg. 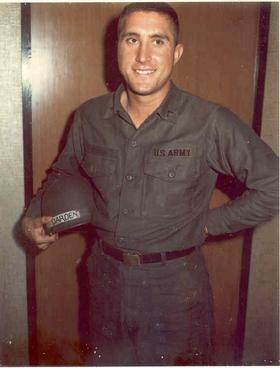 James T. (Jim) Fronkier (photos above) served in both the Marines and the Army. He was first in the USMC 1964-67, including 13 months in Vietnam, leaving as corporal--after which he attended CNC 1967-69, where he was the first president of the first Veterans Club. * Jim served also in the USMC Reserve 9 years, leaving as staff sergeant (photo left). In 1979 he transferred to the Virginia Army National Guard, where he served 15 years, moving from SSGT to 2nd Lt and retiring as a Major (photo right). * A photo of this club is at end of Part 1 of this article. 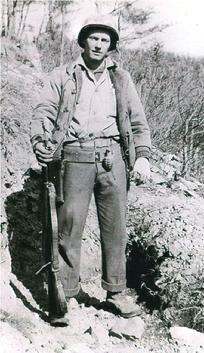 Like Jim Fronkier, Jay C. (Kit) Warren served in two military branches: the USMC and the Navy. 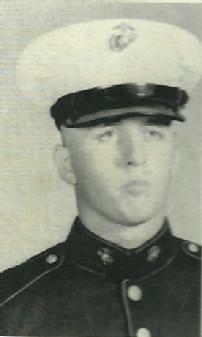 He attended CNC one year (1964-65), then served three years (1965-68) in the USMC, including duty in Vietnam. 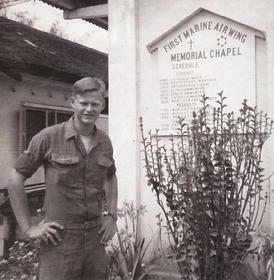 The photo left shows Kit as a corporal on R and R in DaNang, outside a Marine Chapel during Passover. After a year in the Merchant Marines and other adventures, Kit served two more years as a Marine (1972-74). He was promoted to staff sergeant in August 1974 during a Mediterranean cruise (right photo). He then served in the Navy 1975-89, including deployment in Grenada. He retired as chief quarter master. Part 1 of this article honored CNC's 52 First Decaders who served in our nation's Army and also the two who were killed in action: Ric Bahr (Army) and Pat Giguere (Marines). Part 2 saluted the 23 who were in the Navy, the 10 in the Marines, and our first and second CNC presidents who served in combat--H. Westcott (Scotty) Cunningham (Navy) and President James C. (Jim) Windsor (Marines). Part 3 honors those in the Air Force (18) and in the Coast Guard (2) and also shows and names 8 more veterans not yet located. Including OVERSEAS DEPLOYMENTS and RANKS at ends of service. 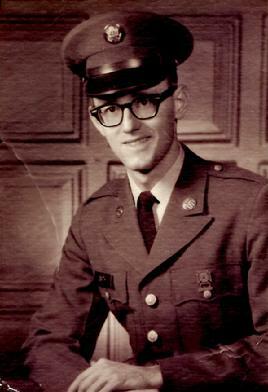 After one academic year at CNC (1965-66), Joseph F. (Joe) Hutchko joined the USAF, serving 1966-70. 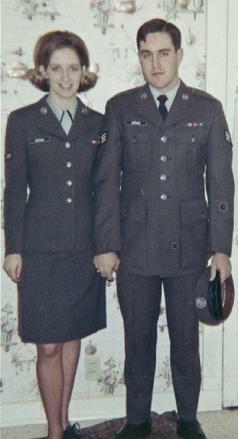 Happily, at his first base assignment, in Syracuse, New York, he met Bobbi, also stationed there, who soon became his wife (photo of them above). Later, Joe spent a year (1969) stationed in Saigon, Vietnam. His last USAF assignment was at a small base in Kansas City, Missouri. He left service honorably as a Staff Sergeant. Joe then returned to CNC and completed his BS degree in Management Information Science in 1974. His is a CNC family, with 13 years of attendance invested there. Wife Bobbi attended three years, their son attended two, and their daughter earned her BS in biology at CNC in four years. 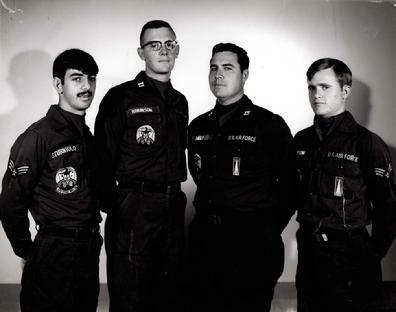 The photo left above is of a 4-man Titan II ICBM combat crew of the late 1960s. The young man on the right is James R. (Jim) Watson. 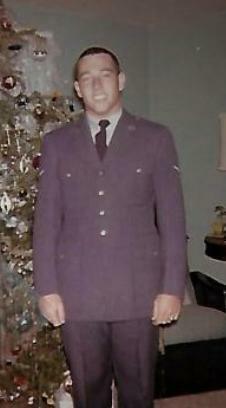 After completing two years at CNC (1964-66), Jim served in the USAF 1966-70. Stationed at Davis-Monthan AFB in Tucson, AZ, he and his crew pulled 24-hour alerts (around eight per month) in remote underground missile sites located 20 to 30 miles from their base. 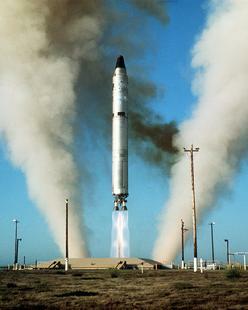 Their job was to keep their Titan II ICBM, with its nuclear warhead, on alert status, ready to be launched (as in photo two) if the order came to go to war. Jim was "so glad that never happened." Overall, he wrote, "The job was very easy, so we had lots of time to read. I read a lot of books and took a correspondence college course during the time I served." After leaving service as a Staff Sergeant, then completing studies at the University of Arizona, Jim became an architect. Edwin J. 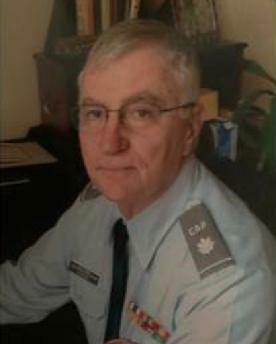 (Ted) McFalls, Jr. served in the Air Force both before and during his attendance at CNC. He served 1961-65 on active duty at Langley AFB, Hampton. The photo in his dress blues was taken at Christmas time in 1962 when he was home on leave. The second picture, in work clothes, was taken at Langley, where Ted was assigned to the 4500 Transportation Squadron Log Air section. He took a moment to smile at the photographer while waiting for a C130 aircraft to land so it could be loaded with cargo going to Vietnam. Ted went immediately from active to reserve duty, serving 1965-67 while also attending CNC, where he was active in track and flag football. He left the USAF at the rank of Airman First Class. 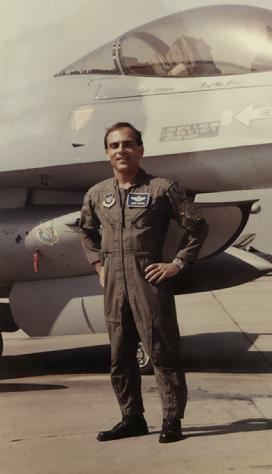 The photo right shows Dr. Herminio Cuervo, MD, in his flight suit while he was serving with the 612th Tactical Fighter Squadron at Torrejon Air Base, Spain, in 1990. After attending CNC, then completing his BS at William and Mary in 1968, Herminio earned his MD & PhD at the University of Salamanca-Spain in 1974. Then he served actively in the USAF 1974-82 in Germany, Italy, and Turkey. In Wiesbaden, Germany, he was Chief of Neurology, USAF Europe. Back in America, in 1979 Herminio earned another medical degree at Harvard University's Medical School. In January 1981, he participated in the Rescue of 52 American hostages held in the American Embassy in Teheran, Iran. Herminio then served in the USAF Reserve 1983-88, deployed to Central America in support of the Contras in Nicaragua., and in 1988, he earned a third medical degree from Florida International University in Miami. He served again actively 1988-93, deployed to Spain, Morocco, Italy and Turkey--during which time he participated in Desert Shield and Desert Storm. He left the Air Force as Lieutenant Colonel. Currently, he is Chief of Neurology at Lakeland Regional Medical Center in Lakeland, FLA.
After completing two years at CNC (1966-68), Michael B. (Mike) Witty served on active duty in the Air Force seven years (1968-75), then spent an additional year in the AF Reserve, ending his service as Tech Sergeant. 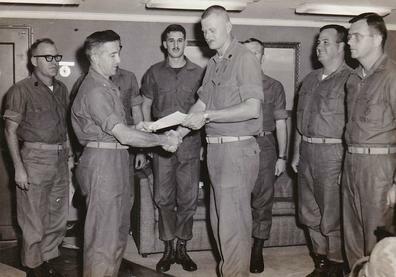 The photo left above shows him receiving an AF Systems Command Certificate of Achievement in September 1971, at the rank of Staff Sergeant. 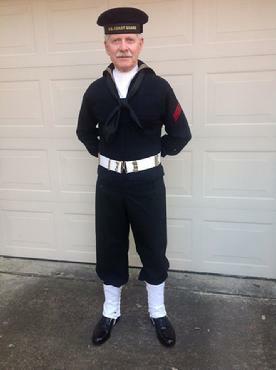 The second photo, made recently, proves that there are some who can still fit into their 50-year-old dress uniforms. Mike posed with his youngest grandsons at their elementary school's annual Veterans and First Responders Parade in Winchester, VA.
Mike served 14 months overseas at Wheelus AFB in Tripoli, Libya (Dec. 1968 - Feb. 1970). The rest of his service was primarily at Wilford Hall Medical Center, Lackland AFB, TX, and Air Force Systems Command Headquarters, Andrews AFB, MD. He took college courses on and off base everywhere he was stationed. A Boot-Strap Degree Leave of six months to attend Culver-Stock College full time in Canton, MO enabled him to complete his BS in Business Administration there in December 1973. Luther (Lew) Richardson (photos above) served 7 years (1955-61) in the USAF in England, Germany, and Virginia. While stationed in England Lew met Patricia, from Liverpool, and married her December 6, 1958. 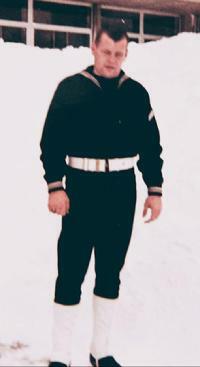 Photo left above shows him in winter dress uniform the day of the wedding. After Lew's deployment in Wiesbaden, Germany ended, the couple moved to Virginia, where Lew was stationed at Langley AFB, Hampton, with the USAF Second Weather Group. On May 5, 1961, Lew participated in an historic event. Astronaut Alan Shepard was piloting Mercury-Redstone 3, or Freedom 7, 90 miles above the Earth, in the first manned orbital flight of Project Mercury. About three minutes after launch, Shepard reported the weather conditions he saw from Cocoa, FLA to Cape Hatteras, NC. Lew heard and taped Shepard's report and immediately sent it to all USA weather stations. It was the world's first pilot report from space. 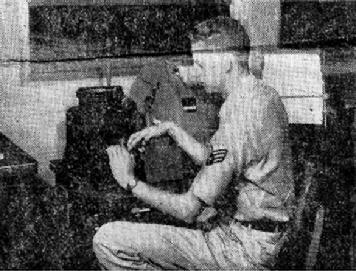 The Daily Press article "LAFB Weatherman Sends Space Pilot's First Report On Conditions" included the second photo above, showing Lew at work. That fall, he enrolled at CNC. Later he enrolled in NASA's Apprentice School and eventually became a computer programmer at NASA. Stationed at Langley AFB 1965-69, Robert J. (Bob) Tutton (photo left) began his academic studies part time at CNC in 1968. After leaving the Air Force, he enrolled full time at CNC, where he completed an AA degree in 1971 and a BA in psychology in 1973 which, he writes, "truly changed my life." His BA, followed a year later by an MS in counseling at VCU in Richmond, started him on a career path in higher education. 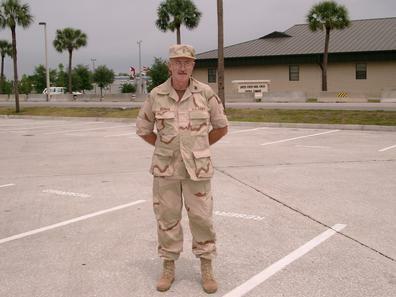 Bob joined the Army National Guard in 1981, serving as a personnel officer, but also, between periods of active duty, working at John Tyler Community College as a counselor. He completed two more advanced degrees while continuing to serve John Tyler CC--an Educational Specialist degree (William and Mary, 1999) and a Doctor of Arts degree (George Mason, 2003). 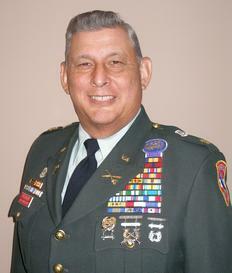 He retired from the Guard in 1999 as a lieutenant colonel. He was promoted in 2005 to academic dean at John Tyler, where he served in that office until retiring in 2008. He wrote that he is "grateful to CNC for giving me the opportunity to launch my education and my career as a professional counselor and academic dean." Dr. James D. (Jim) Lowell, MD (photos above) first attended CNC in 1965-66, while also serving in the US Coast Guard Reserve 1964-66 (Boot Camp photo left). After leaving the Coast Guard, he served in the US Army Reserve 1966-70. While also in the USAR, Jim enrolled in the Riverside School of Professional Nursing at Riverside Hospital, Newport News--the first male in the hospital's nursing program. In 1967-68, he and the other student nurses were bused to CNC for required academic classes. After earning his RN in 1970, and also completing Army Reserve service, Jim worked night shifts at Riverside Hospital while earning a BS in psychology at CNC, completed in 1972. He then earned his MD in 1977 at MCV and completed a residency in family medicine at the Univ. of Manitoba, Winnipeg, Canada. His medical career afterwards included being a fly-in doctor at a reservation in Manitoba, practicing rural family medicine, having a private practice (80% obstetrics), and working in occupational medicine. Currently Jim directs the Occupational Medicine Clinic at Good Shepherd Medical Center, Longview, TX. After half a century, Jim still fits into his winter dress Coast Guard uniform (2015 photo, right). The above photo of the 1970 Veterans Club at CNC is from page 66 of the 1970 Trident. The following students, listed alphabetically, have not yet been located: ANNETTE HENNESSY (Sec), ROBERT HUBERT, TOM HOGGE, JOHN MARCHI, BILL NEEDHAM, CLINTON SWIFT, GEORGE WILLIAMS. Contact us if you can help locate any of them, please! Thank you!